Members of the Brooksville Odd Fellows have been teaching students at the elementary school the game of cribbage as part of their math class over the last six weeks. 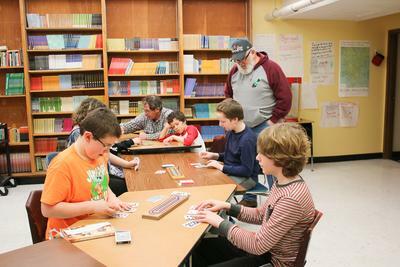 Students are in full concentration mode while counting their hands during games of cribbage. The game of cribbage is a big deal in Brooksville, so much so that Brooksville Elementary School principal and math teacher Cammie Fowler decided to use it as a method of teaching in her classroom. “I was thinking about ways to teach the kids about counting, and then it clicked. Cribbage in Brooksville is such a thing, so it just made perfect sense,” she said. Fowler enlisted the help of members of the Brooksville Odd Fellows, who, in addition to providing other outreach to the school, host a weekly cribbage tournament. Members agreed that it was a good idea, and a six week program developed. Each Friday over the last month and a half, members of the Odd Fellows have been going to the school for one hour each Friday afternoon to teach the students how to play the game. Some of the students already had some knowledge, but there were a few who had never played before. “At the beginning, we couldn’t even get through an entire game in the hour, but now they’re able to do it,” said Fowler. The Odd Fellows gave the students a surprise on their final day of the program. Each student received their own cribbage board, with their names engraved on the back.